CoreX Dip Station is made up of two very functional, versatile, durable and stable dip bars to be used for a variety of exercises including push ups, dips and other push and pull movements, with the detachable strap handles provided. Contoured large rubber boots on the feet ensure more stability with the lateral placement on the floor and these bars are both longer and larger than the competitor dip bars with the small tubular footed bars. You’ll see three paddings to take the pressure of your hands and wrists on each bar: One at the top in the middle for dips and two on the sides for dips. 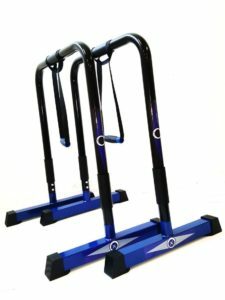 The bars and the bases have a beautiful looking and solid powder coating to make them more durable. 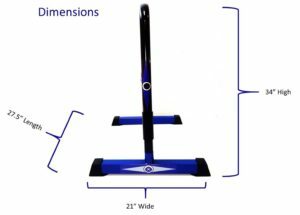 A regular dip bar weighs 8 pounds and each of the CoreX bars are 5lbs heavier = 13 lbs due to more steel being used and can support a maximum user weight of up to 400 pounds so even very heavy adults can work out on it easily without problems. In the box you will get the two x 13 pound dip bars, detachable spin handles with 24 inch straps and an allen key wrench, CoreX Versa Bodyweight Trainer of 31 laminated pages of four workout programs and 18 exercises and DVD for installation and training programs and a mesh carry / storage bag. Bars are 27.5 inch long, 34 inch wide, feet base are 21 inch wide with square feet 2 x 2 inches although they are larger and heavier they are easy enough to move around. These great quality dip bars are solid and sturdy enough to withold heavy use for many years and are suitable for both home (good addition to your home gym) and commercial gym use by different people including professional athletes throughout the day, they work well- do the job fine and will have to be one of the best bars you can get for the money on the market. CoreX Fitness has quite a few resistance and cardio training equipment and accessories that are both affordable and good quality and they’re all offered with decent customer service after the sale.